People all over the world are snapping up consumer electronic devices like never before, and while smartphones, tablets and more portable PCs offer much in the way of benefits, their proliferation also highlights a glaring, dangerous oversight in our consumer-driven societies and manufacturing value chains, as well an urgently pressing environmental problem: e-waste. The worldwide volume of end-of-life electronics is expected to surge higher by 1/3 by 2017, to 65.4 million metric tons per annum. That’s the equivalent of nearly 200 Empire State Buildings or 11 Great Pyramids of Giza, according to a forecast and study by “Solving the E-Waste Problem (StEP) Initiative,” a partnership of U.N. Organizations, industry, government and science organizations. To highlight and zero-in on the issue, StEP has produced the world’s first global e-waste map: the StEP E-Waste World Map. The map presents comparable data from 184 countries, shows the estimated amount of electrical and electronic equipment (EEE – anything with a battery or a cord) put on the market and how much resulting e-waste is eventually generated (i.e. comes out of use or post-use storage destined for collection by a recycling company or disposal,” StEP explains in a press release. Though increasing amounts of end-of-life consumer electronic devices are being recycled or reused in some regions, most consumers continue to simply throw them away. Growing mountains of e-waste are accumulating in countries around – and at what’s expected to be a much faster rate in coming years. 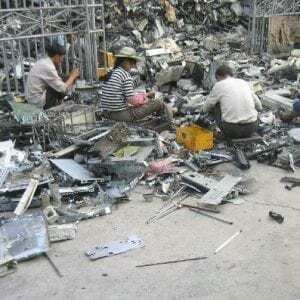 All that e-waste poses significant threats to human health and well-being, as well as the health and integrity of land and water resources, ecosystems and biodiversity. Nearly 48.9 million metric tons of e-waste was produced last year alone, “an average of 19.6 kg (43 pounds) for each of the world’s 7 billion people,” StEP highlights. When it comes to e-waste and electrical and electronic equipment (EEE), China and the U.S. topped the ranks of countries in 2012. China produced 11.1 million tons of EEE and the U.S. 10 million, according to StEP’s data and calculations. The U.S. topped the world’s nations in terms of e-waste, producing 9.4 million tons, and China ranked second, producing 7.3 million. The StEP e-waste report and world map are intended to help governments and companies better plan e-waste management. Create trade codes for used electronic products to enable better tracking and distinction of shipments for example only for repair.